Anfield doesn’t look much from the outside, but inside its impressive; Swans fans are the Anfield Road stand. Get in early for the singing of ‘You’ll Never Walk Alone’ with the red and white scarves and flags held high. The facilities in the stand are OK. There’s a betting booth, a wide variety of burgers, hot dogs and pies, including ‘Scouse Pies’. 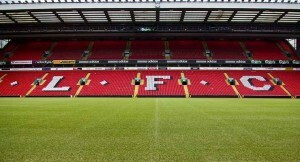 Going to Anfield is a great day out, being one of the legendary venues in world football. Things to look out for are the Bill Shankly ‘You’ll Never Walk Alone’ gates and his statue near the club shop, there’s a statue of Bob Paisley, also the memorial to the victims of the Hillsborough disaster. If you intend making a weekend of it, then book Anfield stadium or museum tickets by calling 0151 260 6677. Popular hotels in the city centre are The Adelphi, Holiday Inn, The Nadler, The Adagio or for those on a budget, The Printwork Hotel. Near Anfield, there’s Melrose Abbey Hotel (L4 3TE). The Merseyside Maritime Museum at Albert Dock (L3 4AQ) has the free exhibition Black Salt: Britain’s Black sailors. The exhibitions shows the contribution black seafarers have made to maritime events of the past 500 years. It’s based on the book by historian Ray Costello, combining personal stories, historic data, objects and memorabilia to chart a course through the past and explores the work of black sailors. Liverpool means ‘The Beatles’, The Magical Mystery Tour leaves from Albert Dock (L3 4AS), and is a two-hour journey around the places that made the Beatles, including Penny Lane and Strawberry Field, tickets are £17.95. It doesn’t operate Christmas Day, Boxing Day or New Year’s Day. Liverpool has one of the largest collections of museums outside London. The Museum of Liverpool is the largest newly built national museum in Britain at the Pier Head. Many other museums are around Albert Dock. All museums are open 10am-5pm but are closed 24th – 26th and 31th December and 1st January. Many shows and exhibitions are closed over the Boxing Day period. The exception is pantomime. The Liverpool Empire (L1 1JE) has Cinderella from 26th December through to New Year; tickets are £11-£40. Other pantomimes are at Theatre Royal, St Helens (Snow White), Epstein (Peter Pan), Echo Arena (Aladdin). The Arkles (L4 0TJ) is the away fans pub, get there early or it will be full and queues to get in. The ‘Flat Iron’ (L4 0SY), is a 5 minute walk away. Although it’s mostly full of Liverpool fans, the bars are mixed and all should be very friendly, there’s also a good chippy opposite. Turn left at the junction at the Arkles (with Anfield to your right). Head away from Anfield and it’s on the right. Opposite the Players Entrance on Anfield Road is a big food court with bar. It sells fish & chips, burgers and hot dogs. Specialist coffee is sold along with beer, wine and spirits; its open 4 hours before kick off and an hour after the game or alcohol is available inside the stadium. There are two ways to Anfield, through mid Wales (180 miles) and motorways (237 miles), both take about the same amount of time, and based on the weather, choose which way you fancy as the route through Wales can be really nice, but not so in poor weather. If you arrive very early street parking can be found. If not, park in the streets around Goodison and walk across Stanley Park to Anfield, or park in a secure parking area at Goodison (£10). Parking at The Dockers Club (L6 0BB) is £5, home of Liverpool County Premier Division side Waterloo Dock, a 15 minute walk away. There is no train service to Liverpool on Boxing Day. Public transport from the city centre is via Merseyrail Northern Line to Sandhills where special Soccerbuses run 2 hours before and after games and drop you nearby. The Soccerbus is £2, £3.50 return (children £1 and £1.50 return).